View of “One of These Things is Not Like the Other,” 2019. Pamila Matharu and Sister Co-Resister's exhibition uses the archive as a method for locating the self. Encompassing video, sculpture, photography, personal artifacts, and a site-specific installation, “One of These Things is Not Like the Other” is structured by experiences of intergenerational trauma as faced by three different women—the writer Lakshmi Gill, the late modernist painter Amrita Sher-Gil, and Matharu herself—weaving these personal histories into transnational narratives of dispossession and resistance. The show opens with a new video by Matharu, stuck between an archive and an aesthetic, 2019, that montages found footage from the early 1990s: a public talk by Gill, news reports, and music television programming. Gill’s voice, detailing her multiple experiences of displacement—first from her home country, as a migrant to Canada, and later from her local community, when she came out as queer—echoes hauntingly in the space, mixing with the voices of Punjabi performers and with the sounds of protest. These materials evidence the temporarily increased visibility that artists of color were provided in major art spaces and media outlets during the heyday of multiculturalist policy in Canada. Nearby, a large-scale reproduction of a scathing review of Filipino-Canadian artist Lani Maestro’s work in a 1993 exhibition at a nearby museum points to the precarity of that institutional acceptance. The adjacent multimedia installation, which Matharu created in collaboration with the feminist art collective Sister Co-Resister, proposes alternative modes of belonging. At the heart of the space is a day bed and lounge area dedicated to the memory of Sher-Gil, whose cause of death seems to have been a botched abortion by her husband, though the details and allegations vary in her biographies. But it is Matharu’s personal archive, Index (some of all parts), 2010–, that attests to the power of collecting as a form of cultural recovery. 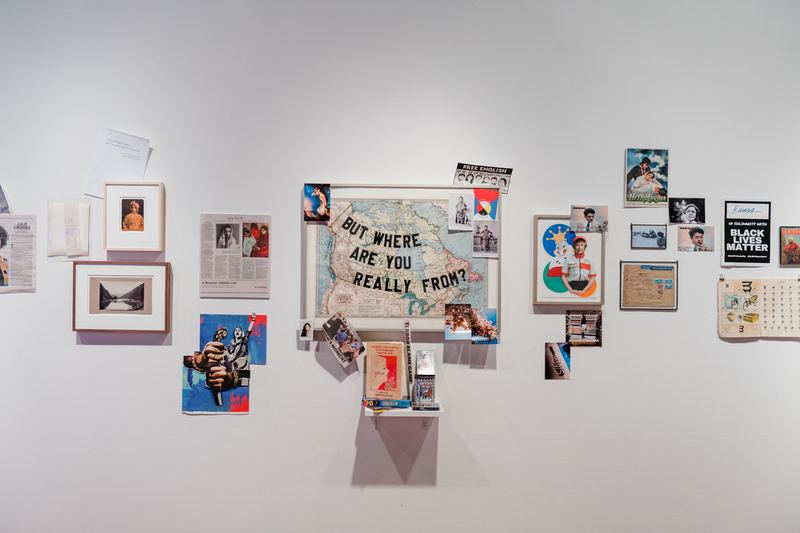 Family photographs and screen grabs of the artist’s text messages with her mother abut clips from historical newspapers, early collage works, and VHS and cassette tapes—a constellation of influences and a set of survival tools for future generations.